In 2019 Derwen College will be running an art competition for students working up to Entry Level 3. With the theme ‘Journey’ this competition will invite entries in 2D, 3D and Digital Media categories. If you are interested in entering your student artists in to this competition, please complete our Expression of Interest form and we will be in touch with you early in 2019. Inclusive Skills Competitions are run by Natspec in partnership with the Association of Colleges, and supported by WorldSkills UK, and enable young people with learning difficulties and disabilities to showcase their work skills and growing independence. 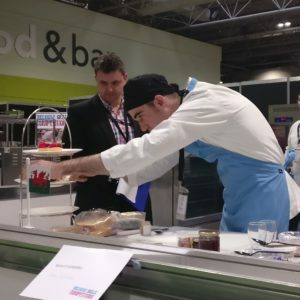 Winners from the regional heats go through to the finals at the World Skills UK Live in November. 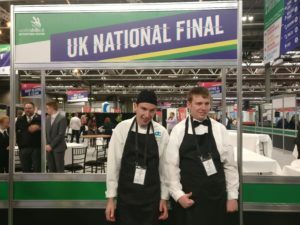 This year two Derwen College students, Adam and Carter, represented the West Midlands in the UK Finals of the Inclusive Skills competitions at WorldSkills UK LIVE at the NEC. Carter was a finalist in the restaurant services competition, and Adam competed in catering. Both competed to a high standard, but unfortunately on the day, the competition was too strong. We are however extremely proud of both Adam and Carter for competing at national level. Staff and students travelled to the show to watch the competition and a great day was had by all! 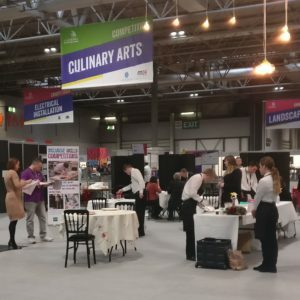 The 2017 Inclusive Skills regional heats took place throughout the year and two Derwen students – Adams Richards and Joe Griffiths made it through to the finals at the Skills Show on November 18th. Adam won a Silver medal for his entry in the Food Preparation competition and Joe won Gold for Restaurant Service – Table Laying. FE Week featured the 2017 Inclusive Skills Competitions in a double page spread inside the Skills Show supplement. In 2016 Derwen College attended the Abilympics in Bordeaux, France as part of the UK delegation.